PASADENA, CA /FLAGSTAFF, AZ (April 18, 2013) – At a major planetary defense conference in Flagstaff, AZ last evening, the Planetary Society announced the winners of its 2013 Shoemaker Near Earth Object (NEO) grants, and was recognized itself for the Society’s long history of international leadership in the detection and mitigation of threatening asteroids, and other planetary discoveries. So, what do the discovery of Asteroid2012 DA14, and the most productive observatory for follow-on (orbit determining) NEO observations have in common? Both are made possible by Planetary Society Gene Shoemaker NEO Grants, now in their 16th year. The Shoemaker NEO grants not only help provide critical information, but also they are crucial to the expansion of the community of advanced amateur astronomers and observers making vital contributions. The Planetary Society also invests time and materials to educate the global community about the threats of NEOs, through participation as a Non-Government Organization on Action Team 14 of the United Nations Near Earth Object Working Group, where Dr. Betts is a member of the action team. The Shoemaker NEO awards typically are awarded in the range of $3,000-$10,000 each. During the past 16 years, the Planetary Society has funded 43 awards to 35 individuals in 16 countries on five continents. Important discoveries include the co-discovery of Apophis, discovery of the naked eye Comet Lulin, and the asteroid 2012 DA14. Information on past winners is provided at the Planetary Society website. ROBERT HOLMES, Astronomical Research Institute (ARI), Westfield, IL, awarded $6,662 for a Santa Barbara Instruments Group STX CCD camera to enhance their .76m telescope for follow-up tracking of NEO asteroids whose positions are not well known. ROBERT STEPHENS, Center for Solar System Studios (CS3), Landers, CA, awarded $8,065 for purchase of a dedicated Finger Lakes CCD camera for a .4m telescope to vastly extend the observational nights of the telescope, critical to determining properties of asteroids. 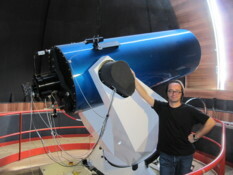 DONALD PRAY, Sugarloaf Mountain Observatory, South Deerfield, MA, awarded $8,070 for the mirror, structure, and focuser of a new .5m telescope that will enhance detection of NEO trajectories. ALBINO CARBOGNANI, Astronomical Observatory of the Autonomous Region of the Aosta Valley, Italy, awarded $9,120 for improvements to their .81m telescope, providing enhanced sensitivity and wider field of view, enabling more asteroid position and physical properties measurements. GARY HUG, Sandlot Observatory, Kansas, awarded $2,390 for computers and software that will allow more observations and reliability with his .56 telescope. The Planetary Society sincerely thanked its expert international advisory panel: Timothy Spahr, Director of the Minor Planet Center, Smithsonian Astrophysical Observatory, USA; Alan Harris, MoreData! USA; Carl Hergenrother, University of Arizona, USA; Petr Pravec, Ondrejov Observatory, Czech Republic; and Duncan Steel, University of Canterbury, New Zealand – and gratefully thanked its Society Members for their financial support to make these Shoemaker Grants possible. The Planetary Society has inspired millions of people to explore other worlds and seek other life. Today, its international membership makes the non-governmental Planetary Society the largest space interest group in the world. Carl Sagan, Bruce Murray and Louis Friedman founded The Planetary Society in 1980. Bill Nye, a long time member of the Planetary Society's Board, serves currently as CEO. The Planetary Society began the Gene Shoemaker NEO grant program in 1997 and it was named for pioneering planetary geologist Gene Shoemaker, whose lifetime of discoveries have significantly helped scientists to understand the process by which asteroids impact planets, and the nature of the NEO population. Funding for the Shoemaker NEO awards is provided through generous contributions of The Planetary Society members and supporters and to date more than $270,000 has been provided.